Just a short post for today. 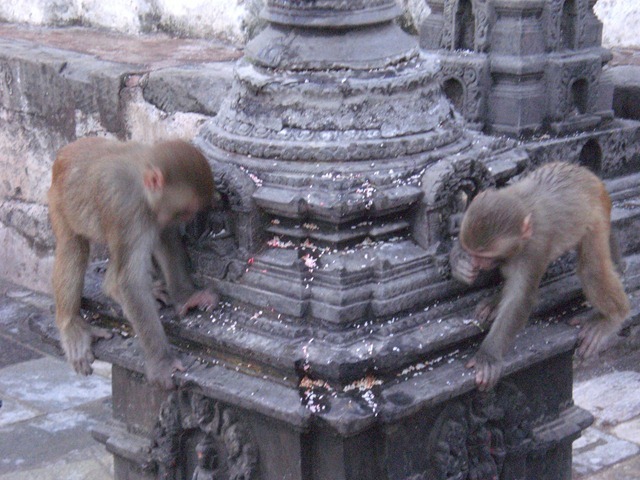 We spent our last evening in Nepal by walking to the Monkey Temple, a beautiful mountaintop temple overlooking Kathmandu. It was raining slightly, but just enough to keep the dust to a minimum and to clear the air a bit, giving us our first good view of the city from above. While it is a fairly dirty and polluted place overall, most of those thoughts fell away when seeing it all at once from the Monkey Temple. The walk was about 30 minutes and it was good to get some exercise after we overdid it a bit with a huge meal of chicken curry and garlic naan. Delicious, but we needed the walk. Once you finally make it through the winding and muddy streets, over the river, and actually through the woods (no grandmother’s house, at least not one of mine), you have to climb an eternity of steps to reach the top of the temple. For this, you are rewarded. We arrived at dusk, plenty of time to see the city in natural light and monkeys crawling everywhere, but late enough to see hundreds of candles being lit around the stupa. Overall, it was another great sight, especially given how many temples we have been to in the last few weeks. Following the temple, we turned in early in order to make our 6:30am car to the airport (thanks again to our wonderful hosts at the Hotel Courtyard in Kathmandu). After multiple searches of our backpacks, especially Ty for some reason (he is looking a bit shifty with that beard), we boarded our flight and I pretty-much slept all the way to Delhi. After a nice day of rest, we were back at it again yesterday. 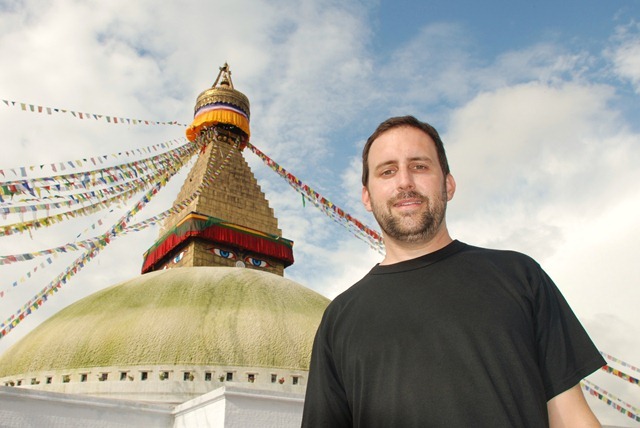 We hired the hotel driver to take us sightseeing around Kathmandu which ended up being a seven hour journey. Again, in a car. Actually, it was worse this time because it wasn’t a Land Cruiser, but a Kia Rio (small car). The sights were great, but as we have mentioned numerous times, the roads leave quite a bit to be desired. 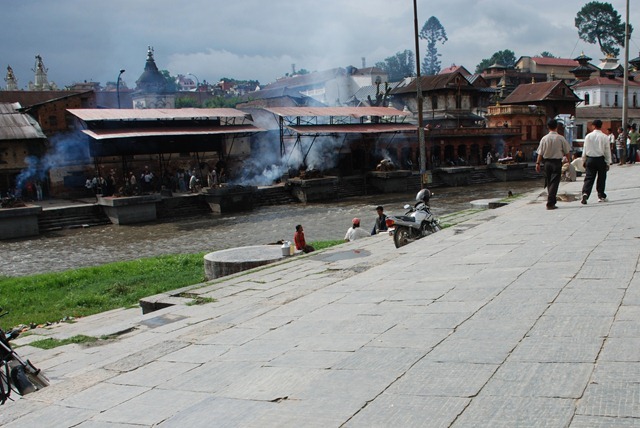 Check out the photos section under Kathmandu to get a taste of the traffic. During the cremation process, the eldest son shaves his head and wears a white cloth. The body is wrapped in yellow cloth and lowered to the river to be anointed with water. Then the body is walked 3 times around the pyre and then laid on it. The pyre is lit by the head and the body covered with wood and straw. You can’t actually see the body being burnt (nor would you want to ). Eventually the ashes are swept into the river. Poor people and small boys scour the river for belongings such as gold fillings etc. Its is a moving process to watch, mainly because western society tries to deny the existence of death, whereas in the Hindu culture it is a fact of life. It was quite upsetting to hear people grieving but it did seem a very dignified way to send off a relative. It was fascinating to watch and clearly the first time I had ever witnessed this. The grounds were also very interesting and beautiful. Eventually we returned to the hotel exhausted again. We took the easy route on dinner again (Italian) but at least we had a very local lunch (I had water buffalo momos (dumplings) at a cafe in Bhaktapur). Before heading back we walked the streets of Kathmandu’s touristy area again, listening to the various cover bands playing everything from Bon Jovi to Kings of Leon. Today has been another fairly restful day, and it is our last full day in Nepal before heading to India tomorrow. After breakfast I took a long nap and then we walked to the Garden of Dreams and the former royal palace (now a museum). The palace was very interesting, especially seeing the spots where in 2001 the crown price shot and killed the King and Queen (and others). No photos were allowed (very strict) but there are plenty on the web. We plan to visit the monkey temple later this evening before dinner and then off to bed before our 6:30 am car to the airport. Yikes. Today was a rest day. We needed it for sure. It seems like every day has been a huge adventure including hours in a car on rough (to put it mildly) roads filled with dust and pollution. Because we did very little, I thought I would catch you up on Kathmandu in general and some overall impression from the trip thus far. First, infrastructure. Like India, there isn’t much here in Kathmandu. We are at a great hotel but there is only power about 85% of the time and the Internet is glacial speed at best. At least they have it. The act of uploading photos has usually taken overnight for each day’s worth. Painful, but were making it (spoiled Americans, I know). Second, food. This has been a highlight. While we are in a very touristy area and things are relatively expensive, the food has been great. After days of yak meat on the road, the first thing we did was hit a great Italian place and have a huge pizza (one each). This place was good by US standards, not just because we were starved. In fact, we went back the 2nd day just to make sure (pasta this time). Tonight we had a big chicken curry on the roof of another great restaurant where we even caught a glimpse of the sunset. Breakfast at the hotel even includes made-to-order eggs and pancakes if you want them, along with fruit (which we barely recognized after Tibet). Third, traffic and the street vibe. This place is crazy. Near our hotel the streets are tiny, but cars, motorcycles, bicycles, and people somehow squeeze through them. There is a great shopping/eating street near our hotel and it is filled with people trying to sell things. The most popular items on offer: tours, taxis, and marijuana. Every two minutes someone is asking “You want smoke?” or “You smoking?” or any variation you can think up. This is clearly a dream place if you love the Grateful Dead, Bob Marley or Phish. At night it seems to get quite hopping with live bands and clubs, but Ty and I haven’t been up past about 10pm on the most of the trip. I guess we are getting old. Fourth, the weather. This is the rainy season and we had heard bad things. Not so. While it has rained every day, it usually does it late at night or only for about 30 minutes. Frankly, our weather has been great for almost the whole trip (picture me knocking on wood right now). Lastly, philanthropy. It is everywhere and that is both good and bad. We met a great couple at our hotel the first night who run what seems like a great organization. They, partnered with another NGO, rescue Nepali girls that have been abducted and forced to join Indian circuses (because they look exotic). Once rescued, they bring them back and re-integrate them by teaching them artistic tile skills (and helping them sell the finished product). Some of their work is on display at the hotel and it is excellent. Here’s the downside, and we heard it from them and Room to Read…. 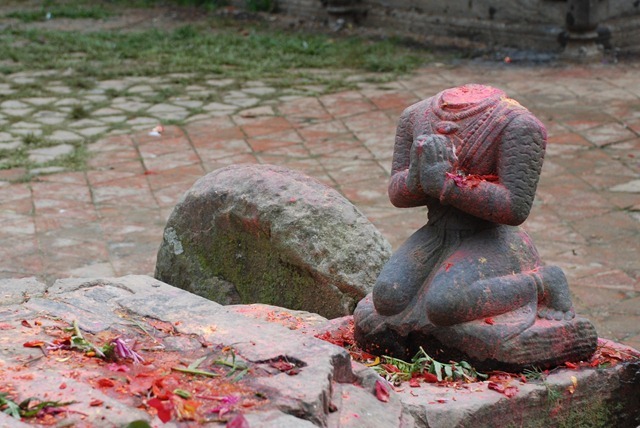 Charity is so prevalent here in Nepal that is has become a trade of its own. People are literally capitalizing on people’s good will for profit and they are doing it in droves. Fake charities everywhere or good ones being embezzled from, etc. It sounds like an epidemic and a really hard one to combat, because everyone that comes here wants to help. That’s it for now. 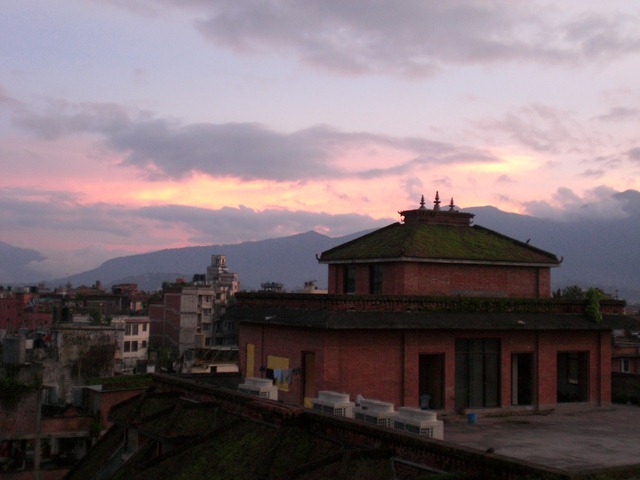 Tomorrow is a big day of sight seeing around the Kathmandu valley. I’m sure we’ll be templed out again. Oh, I threw some more photos up as well (see the photos section). Look for more posts later today at some point – I am two days behind but hope to get some quality time on it today. I have been waiting years for this. 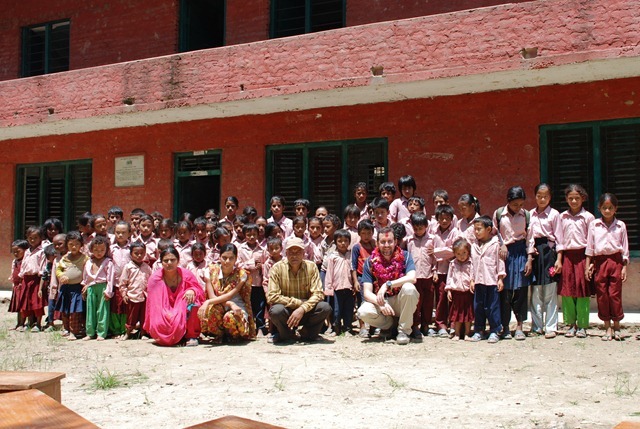 I lived in Asia for 4.5 years and not only did I somehow miss visiting Nepal during that time, even worse was not seeing the school several friends and I donated in 2004 (completed in 2005) through Room to Read. 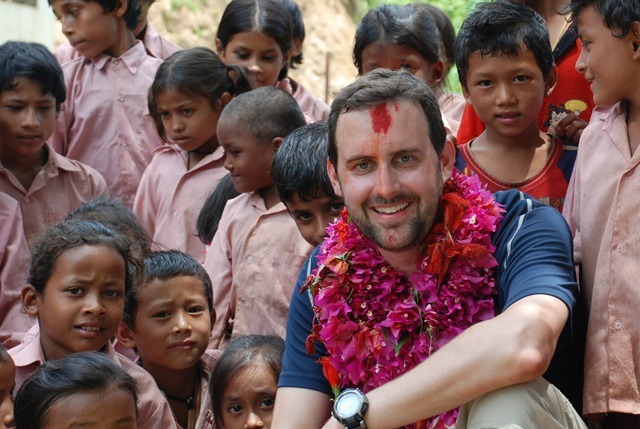 This school and Room to Read overall were not only a game-changers for me in terms of philanthropy, but it eventually led to me meeting my fiancé Sonya in Sri Lanka! Still, I had somehow never been to see the school and a big reason for this whole trip was for me to finally check that box. 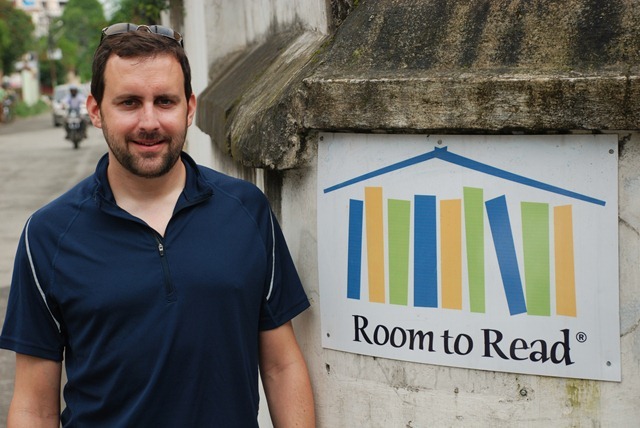 We met Arun (from Room to Read Nepal) at the RTR offices in Kathmandu and immediately drove for about 1.5 hours South toward Dhading. Eventually we pulled to the side of the road, grabbed our cameras and headed for the hills (literally). 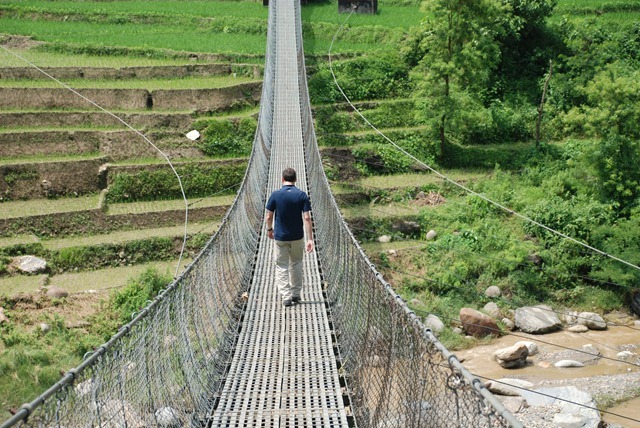 First step was crossing an amazing suspension bridge and then about 45 minutes of hiking in mud and rice fields up some steep hills to the school (glad we wore the boots). It was blisteringly hot and humid. I was a sweaty, muddy mess when I arrived but that was easily forgotten when I saw the reception. Keep in mind that the school is closed right now because of the monsoon season, so theoretically there shouldn’t have been anyone around. What we saw however, was about 50 students (in uniform) and about 50 parents, teachers, and community officials all lined up to greet us. I have seen this before when visiting other RTR projects, but you can imagine the difference when a) it is your project, and b) you aren’t traveling with a big group that usually includes John Wood (RTR founder) and others donors. They did this just for us. The school has five classrooms and a library. They want to expand to six so that Kindergarten and 1st grade don’t have to share a room. The students put enough flowers around our necks that I could barely move, and that was only part of them (the rest wouldn’t fit). They also filled our hands with flowers and other offerings of thanks along with the customary red markings on our foreheads (which eventually were running down our faces with the sweat). It was overwhelming. We sat for about 30 minutes while the community leaders spoke to us, giving thanks for everything that has been done and telling us how important the school had been to their villages. We toured the school where they showed us each room with great pride and repeated how much better this was than the previous building, which had pretty much collapsed. Most of these students walk for miles through mud (often with no shoes) to get here every day, and they LOVE school. This is such a contrast to America and other developed countries where school is often a chore for kids. The children were very shy at first, but there’s nothing like a camera and especially video to get kids interested. By the time we left they were crawling all over both of us and having a great time. Thanks to Dominic Carr, Donna Hindson, Oliver Roll, Claude Brown, and Annie Bacon who were the other donors, and to Room to Read (Stephanie and Arun in particular). More importantly, I want to call out my parents who provided me the education that made it possible to help these people with theirs. Amazing. Thank you. 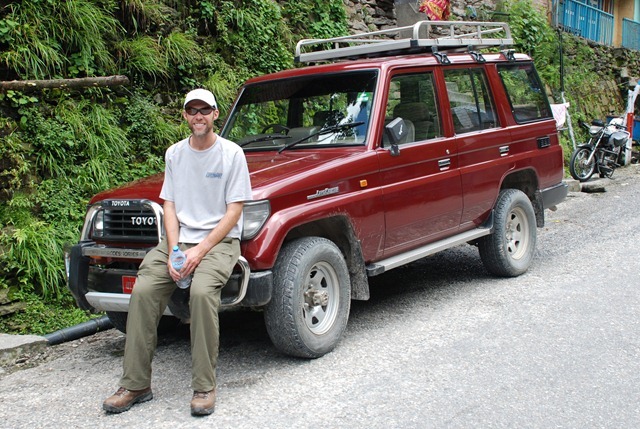 After a decent breakfast in our sub-par hotel, we loaded up the Land Cruiser one last time and headed for the Nepal border which was just a few kilometers away. The border opens around 9:30 or 10am so we stood there waiting outside for about 40 minutes and then proceeded in. Unlike most borders I have crossed in my life, all of the restrictions on this one were around “getting out” vs. “getting in,” meaning that the Chinese were extremely strict about letting you leave Tibet, including detailed searches of our bags and multiple checks of our documentation. The most interesting part was what they were searching for. At most borders it would be drugs or other contraband, but in this case it was messaging – they spent the most time during the search on our books, trying to figure out if they contained pro-Tibet or other illegal messaging that we might be trying to take into Nepal. Once we finished the checks, we said goodbye to Dickey (our Tibetan guide) and found our Nepali guide (Mongal) waiting. Nepalese are not allowed into Tibet and Tibetans aren’t really allowed to go anywhere except China, which was the reason for the switch. Mongal then escorted us by foot across the friendship bridge into Nepal where another Land Cruiser was waiting with yet another driver. First bit of information we got was “it rained a lot last night so there were some land slides – we might have some delays.” Sure enough, within 5 minutes of driving we ran into a huge mudslide that covered the entire road. No word on when a bulldozer would arrive to start fixing it – either way it would be a couple of hours minimum, so we returned up the hill to find lunch in the village. Lunch was at a small hot springs along the river, where people (mostly truckers) pay to take showers and grab a bite. It was dirty, but it worked. The best part was talking with our new guide as he was a great guy and a wealth of knowledge. The most interesting part was a clear container behind the counter that looked like something you would hold orange juice in at a hotel buffet (with a spout at the bottom). Inside of it (we even went behind the counter to look closely), was a nasty selection of small lizards, snakes, and other things I couldn’t begin to describe, all fermenting into an alcoholic beverage that Mongal described as “scary.” We would not be sampling this to confirm. Eventually, we made it back to the mud slide a couple of hours later and the bulldozer had just arrived, busily clearing dirt and rocks while perched on a small cliff above the river. 30 minutes later the road was clear and we were the first to cross. We passed about five more of these slide areas shortly thereafter, but they had all been cleared. The driving was again quite treacherous. The next major delay was even more exciting, and slightly nerve-racking. 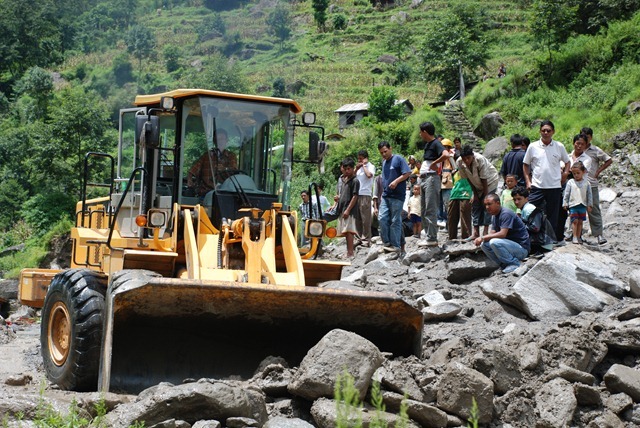 Through conversations with other drivers, the word came through that in an upcoming village the night before, some police had beaten some kids (after suspecting them of trying to put nails in the road) and the village had decided to strike by closing the road with piles of rocks. We were told they village people and police were “negotiating” and that the road would clear eventually. After an hour of waiting in the blistering heat, they removed the rocks and we were on our way again. Mongal told us this was completely normal – happens all the time. Things are never boring on the “Friendship” Highway. If you remove yourself from all of the mud slides and conflict, the valley and road are gorgeous. 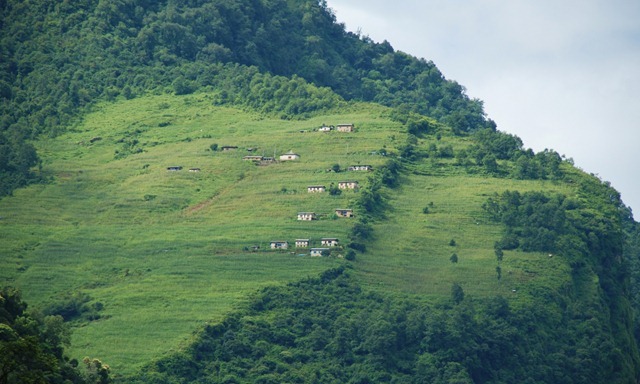 Like the Tibet side, there are waterfalls everywhere and small villages dot the extremely green hillsides. The river we were following had small suspension bridges (one even had a small resort run by New Zealanders offering bungee jumping from the bridge) every few miles and every free piece of land is covered with rice fields, corn, and soybeans in small shelves all the way up the hills. Beautiful. The lower we got in the valley, the more traffic we encountered, the hotter it got, and the population density started increasing. There was also a large section where the dirt was extremely red with clay which was great mixed with all of the green of the jungle. 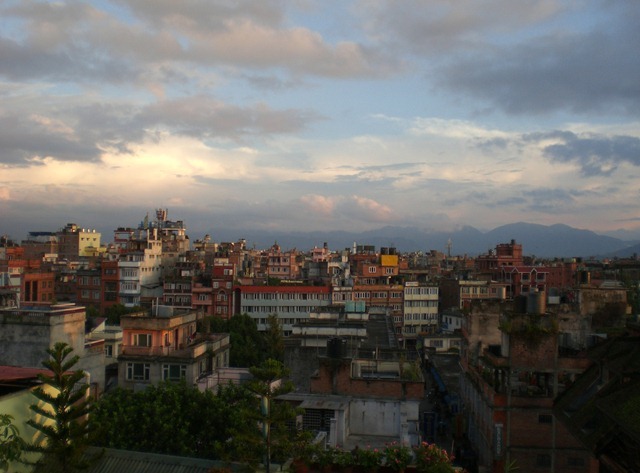 Eventually we entered suburbs of Kathmandu and things turned quite disgusting. Dust and pollution everywhere. Chaos. 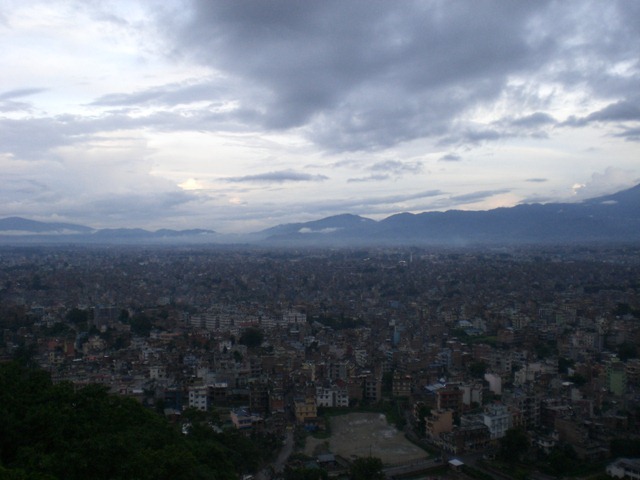 Kathmandu is a very poorly managed (even for a developing country) city. The roads and traffic are horrible. 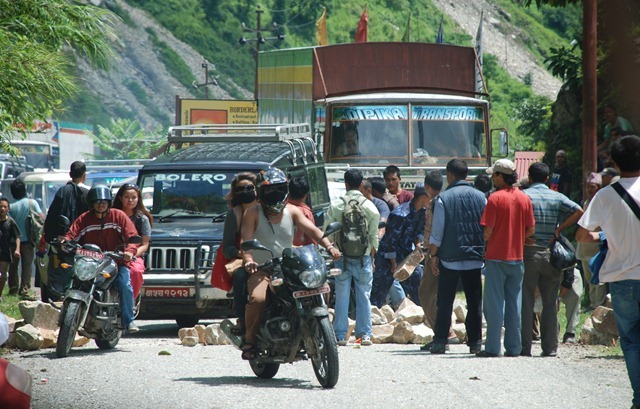 All told, our “short drive” into Kathmandu from the border lasted nine hours. Yes, nine. We arrived at the Hotel Courtyard exhausted and hungry. The last thing we wanted was another crappy guest house and we were pleasantly surprised for sure. It is run by a great couple from Seattle (lived in Green Lake). He was born in Nepal but spent most of his life in India and Seattle and she is American. The hotel is the former home of his family (it is huge) and they have gone out of their way to make it a small oasis in an otherwise dirty and chaotic city. So far, we highly recommend it.